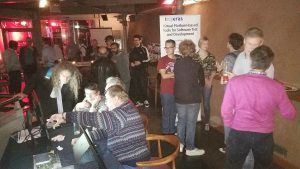 It was with slight trepidation that we organized the first RISC-V Meetup last week, which took place at the venue Zero Degrees in Bristol. Obviously here at UltraSoC we are very aware and involved in the RISC-V architecture from a global perspective. 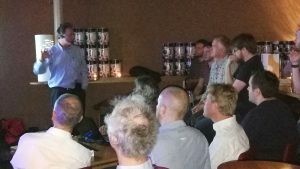 But this is the first time that we have hosted a specific RISC-V event to a local, UK, audience and we were not sure how it would be received or if anyone would actually turn up! We needn’t have worried… The event was very well attended and it was interesting to see quite a mixed audience, from students interested in getting involved in projects related to RISC-V, engineers and designers, through to partners and even potential customers. Many of the attendees were meeting for the first time and benefitted from hearing about different projects and experiences of using the RISC-V architecture, which is great. We have seen momentum really picking up over recent months throughout other parts of the world, especially in the USA, but we felt the UK is seriously lagging in terms of engaging with RISC-V: this event was an opportunity to address that. The Meetup format is a great opportunity to educate and to increase awareness, as well as to openly discuss real or potential opportunities. That’s what open source is all about! At this first Meetup, UltraSoC CTO Gajinder Panesar ran through the history of RISC-V (and indeed a little about the history of RISC computing) and outlined the recent progress within the RISC-V Foundation, including the rapid rise in the numbers of individuals and companies joining the Foundation. He also gave a short update on UltraSoC’s work in RISC-V, including our involvement in the debug and trace groups. Gajinder was joined by Simon Davidmann of Imperas, who outlined his company’s own developments in the RISC-V sphere. Dave McEwan from the University of Bristol also shared his views from an academic perspective. It wouldn’t be much of a Meetup if people just sit and listen to presentations. We had a couple of RISC-V demonstrations which drew a lot of interest and engagement. And the discussions, along with the questions asked, highlighted the varying levels of knowledge of the attendees. Interesting questions, ranging from the potential applications for RISC-V to technical specs of UltraSoC IP. It was great to have the opportunity in this community forum to address them and to build awareness and knowledge. 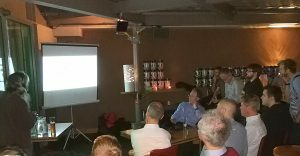 We think this first UK RISC-V Meetup went so well, we are going to do it again: The next RISC-V Meetup is in Cambridge on 20th November 2018 and will be jointly hosted by UltraSoC and Imperas. There will also be a second Meetup in Bristol in the coming months. If you are interested in speaking at a forthcoming RISC-V Meetup, please do get in touch. This community is to provide an open platform for all in which to share experiences, to build understanding and open doors to opportunities based on the RISC-V architecture. Please click to secure your place at the Cambridge RISC-V Meetup and please also click to join the RISC-V Meetup Groups – Cambridge and Bristol. We are aiming for these groups to be a growing community forum for discussions and interaction, and they will be kept updated with all the details about the forthcoming local RISC-V Meetups. Thank you to those of you who came along last week. It was great to see you and we hope you found it to be interesting and beneficial. Look forward to seeing you at the next one soon!